We are pleased to introduce the Sunset Trail and Sunset Trail Grand Reserve by Crossroads RV. With today's technology, we don't believe you should have to in sacrifice structure, comfort, or beauty to achieve lightweight towing travel trailers. Through ingenious engineering and design, the Crossroads Sunset Trail achieves both. Step inside and look around these beautiful interiors, and it's hard to imagine that these are lite weight units. You'll find an abundance of innovative features such as the two-way swivel fireplace and entertainment center that allows the fireplace and or TV viewing from the bedroom or living area. Rich decors, comfortable furnishings, and large storage capacity create easy going lifestyle. All aluminum cage construction that includes aluminum framing around wall openings such as windows, appliances, and compartments. With Crossroads Sunset Trail, the comforts of home come right along with you. They've included many standard features that are offered only as options, or not at all, on other brands. Efficiently designed kitchens, cozy bedrooms, and roomy bathrooms reflect our emphasis on comfort. With so many smaller tow vehicles on the road, we felt having another quality ultra-lite travel trailer would enhance our current product offerings. With the Slingshot, all models weigh under 5000 lbs., including their 32' quad bunk model with slide out. 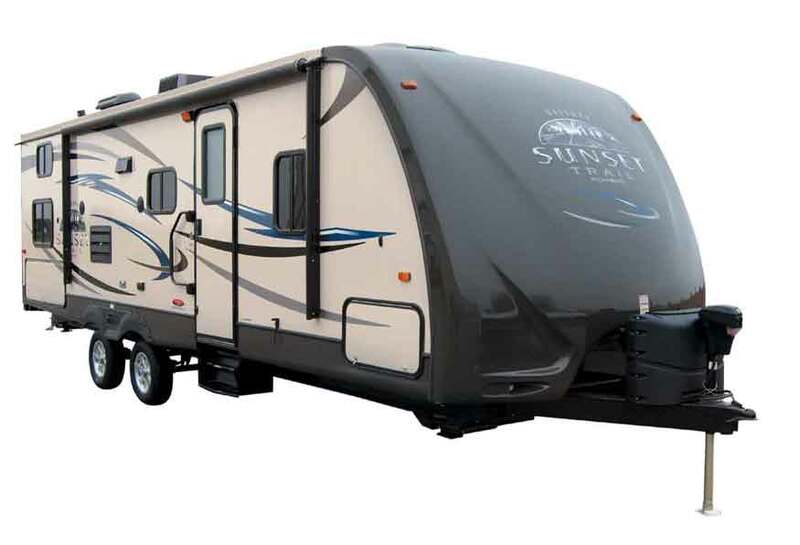 The Crossroads Slingshot it the lightest of all the trailers offered by Crossroads RV. All The Slingshot utilizes the same aluminum cage found in the Sunset Trail. Most ultra-lite towables are built with a 1 1/2"wall to cut down on weight, but Crossroads doesn't believe in taking away structural integrity to save weight. All Slingshot trailers are built with a 2" wall and the same two inch wall construction, unlike the 1 1/2" thick walls found on most ultra-lite travel trailers and its backed by a full 2 year warranty. With over 11 floorplans starting at only 3100 lbs, the Crossroad's Sunset Trail will be sure to have exactly what you are looking for in a trailer you can tow.